The main reason for my delay is that I’ve been trying to decide on a template to keep the race reviews consistent. I want to deliver information to you that may help you decide on whether or not to do the race in the future, but I want to be sure I don’t miss anything. So that has contributed to my belatedness as well. Please accept my apology and know I’ll step things up to get you more timely and accurate information. Here’s is what future reviews will entail…. Race details such at distance, time, location, weather, cost, sponsor/charity, etc. Runner information such as how many, ages, etc. Miscellaneous such as history or race or area, local legend, etc. For the overall rating this year, I thought I would use something visual. At first I thought I would use the Star Rating with one star being a bad race and five stars meaning it was a great, can’t-miss-this-next-year race. But I didn’t think stars really related much to running. So I decided to use medals. Hey, we all love to get medals from the race…. this was my chance to give a medal back. So I will give gold medals to top races, silver medals to middle ground races, and bronze medals to the needs-a-lot-of-work races. Of course, please realize I’m giving you “MY” opinion of the race…. there are always others with different opinions. But I do try to be open-minded when rating something. Finally, and something I’m very excited about is the fact that I may have some guest bloggers helping me with race reviews. 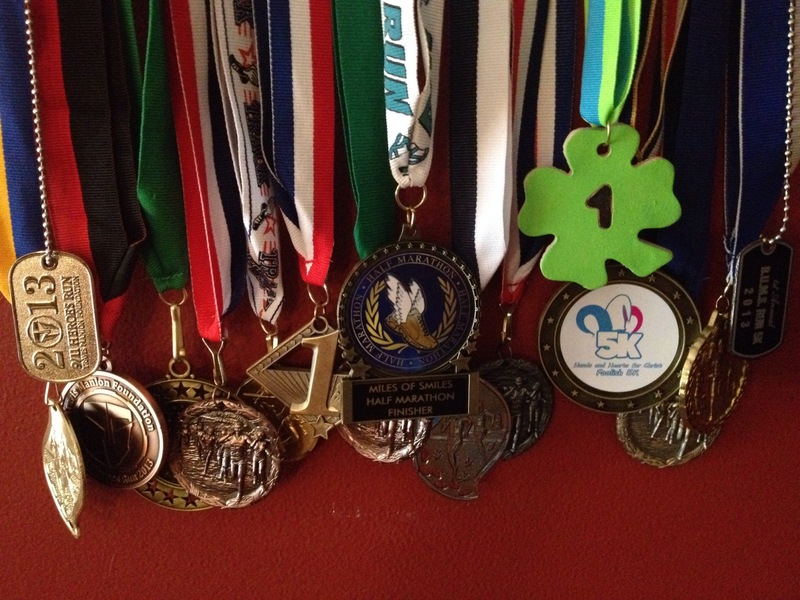 Last year I ran in a lot of races, but of course I couldn’t hit all the races in West Virginia. So I’m talking with some running friends of mine that hit races in other areas and of different distances to add some spice to my race reviews. So I wanted to write-up this short post to let you know what’s coming to my running blog in the very, very near future. If you run West Virginia races and would be interested in sharing your review here… just let me know. I can’t pay you for the review, but I can help promote your blog, website, Facebook or Twitter page. It’s always interesting to get a review from someone else’s perspective. What do you think of the template I’ll use?? Is it too much information?? Am I missing any information someone may want to know about races here in West Virginia?? I set a much better time on the second half at 02:19:18 since it wasn’t a trail race. Trail racing is very, very, VERY hard!! Never ever underestimate the trail!! Don’t try to carb load with a heavy pasta dinner the night before the race…. start two days prior and end with LUNCH the day before! LISTEN TO MY BODY!! If I’m in pain, get it checked!! Just because I burned 1,000 calories doesn’t mean I can eat 1,200 calories of junk food!! Seriously!! Don’t skip the long run! And finally, when I look at what I’ve done right and what I’ve done wrong… here’s a look at where I started a year ago to where I am now… 12 months later…. January 2013 I ran a total of 53.92 miles…. December 2013 I may double that as I currently sit at 93.39 miles and 3 days left to run… yea, I’ll double that!! Probably one of the coolest things about my running adventures this year is how I’ve made literally hundreds of new running friends both in real life as well as virtually. I started out running alone, but then moved up to having my racing buddy, Wanda join me for most of my races and even my husband for a few. Now, I’m part of a group of ladies who support and cheer each other on as we train and go to races together. Additionally, I’ve met friends that I keep running into at different races on the circuit (no pun intended). Then there are the virtual running friends I’ve met…. I started a Facebook running club called Central West Virginia Road Runners Club where I’m keeping in contact with folks in my area. 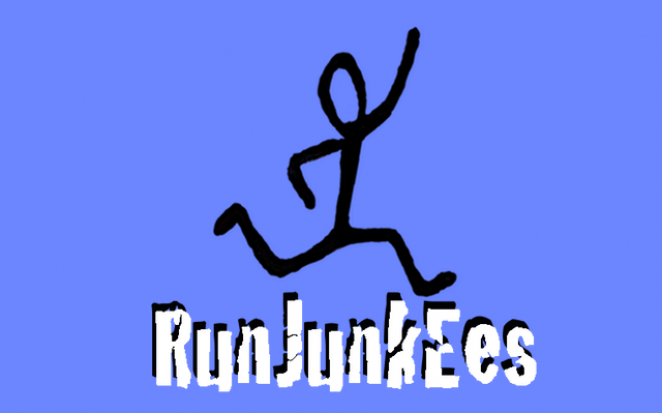 I’m also a part of an awesome Facebook group called Run JunkEes Run Club. On Twitter, I virtually hang out at #RunChat and participate in a virtual group discussion every Sunday night. It’s a great way to get and receive motivation and inspiration. I would love to hear how you did in 2013. Leave a comment below telling me about it, or better yet… I encourage you to write a post on your blog about it. Let me know, and I’ll definitely stop by to read about your accomplishments and share it with my virtual friends. This morning, I crawled out of bed at 6:30am to get ready to meet Wanda for this weeks’ race. We had chosen to run in the Calhoun Days 5k Trail Run/Walk in Calhoun County, West Virginia to support the Calhoun County Park where the race was held. As I was making my coffee, I looked out of the kitchen window at the thick fog that hid everything past our driveway. I walked outside on the front porch to sip on my coffee and get an idea of the temperature. It felt cool, and I was certain that we would have a good day of running as long as the cool morning lasted. Start-time for the race wasn’t until 10:00am, so the sun could still come out hot enough to burn off the fog and heat up the morning. Knowing we were in a trail run was a comfort as one could safely presume we would be running through or, at the very least on the edge of the woods which would keep us cool. I had to run some errands before I met up with Wanda at our designated time and location, so of course I was running about five minutes late. Fortunately, Wanda is laid back, so she didn’t mind. We always leave early enough to be at a race at least an hour early, so we knew we had plenty of time. We actually arrived at the race just as planned at 9:00am, We were one of the first participants to check in and pick up our packet, so the delay didn’t hurt us at all. Once we got our packets, the next thing we did was locate the bathroom and changed our shoes. I brought both my Saucony Mirage3 as well as my Brooks PureConnect 2 as I didn’t know what to expect with the terrain. I decided to wear the Mirage3’s when I saw how damp the grass was due to the heavy fog. I can get a little better traction with the trail shoes, so I probably needed all the help I could get to keep from slipping. We all met at the top of the hill for the race director to make some announcements. We had group prayer prior to the race as well which I greatly appreciate. I’m thankful for the health to be able to run the race and covet God’s protection for myself and all the other runners. A few directions were given and then a warning from the XC coach about “Big Mama”, a steep hill we would face somewhere on the course. The coach was very familiar with the course as it is the trail used by the XC team for training and meets. We started the race on time with 42 participants taking off from the starting line. It was a good turnout for the first race the Calhoun Days committee had ever done. The race director did a good job publicizing it on Facebook and throughout the community and high school XC teams. There were kids from at least two, possibly three different high school teams participating. Runtastic GPS map of the course. The trail was not a disappointment at all. I ran XC one year in high school when I was a sophomore, and the smell of the autumn air and the sound of footsteps hitting the grassy trail brought back memories from many, many years ago. It made the race exciting. The course ran around the edge of the Calhoun County Park and included running through meadows, beside and through woods on lightly gravelled trails, on one-lane gravel roads and a couple of mud puddles. I was very impressed with how well the trail was maintained as not once did I have a concern or worry about tripping over something. Also, there was plenty of room for runners to pass each other. My Runtastic app showed that the length was actually 3.4 miles. I asked three other people what their apps read, and they all had the same distance reading. Personally, I don’t care if it’s a little more or less than an actual 3.1 5k … everyone is running the same distance. Most races are off a little anyway, so I’ve learned to not pay much attention to the overall time, but the pace. I ran an average of 10:00 minute/mile pace, which is over 1:00 minute/mile slower than the race I ran in last weekend, but this was a hilly trail race so a slower pace was to be expected. In regards to elevation gain, there were 3-4 minor hills included in the trail, and then of course “Big Mama.” At around the 2.5 mile mark, The CCHS XC coach was cheering us on from the sideline and telling us “Big Mama” was just ahead. All I could think was… Dang!! I was hoping that last hill was “Big Mama!” Well, “Big Mama” definitely gets her reputation honestly, as she was quite steep and long. Some people like having the hardest part of the course at the end, but I would prefer to hit a big hill like that at the beginning to get it over with while I have lots of energy. So I struggled up her, but fortunately coasted down to the finish line once I got over her. All in all, this course was absolutely beautiful yet challenging. Not impossible, but definitely not a walk in the park either (no pun intended). As a matter of fact, Wanda and I talked about making the trip once every 6-8 weeks to run this course as a strength training run. The director, Amy Nicholas told me this was the first time she had ever directed a race, but you would never know it. She did a good job running the race, and we all walked away with a really cool T-shirt and some other goodies (see below). I placed 1st in the 40-49 year old Female division, and Wanda placed 3rd. We have decided we will be doing the Second Annual Calhoun Days 5k Trail Run/Walk next year, and look forward to it already. If you’re looking for a small race that’s run well, with courteous participants on a beautiful, challenging course that supports a worthy cause, then watch for this race on the RoadID and iPlayOutside websites. See ya next year!! 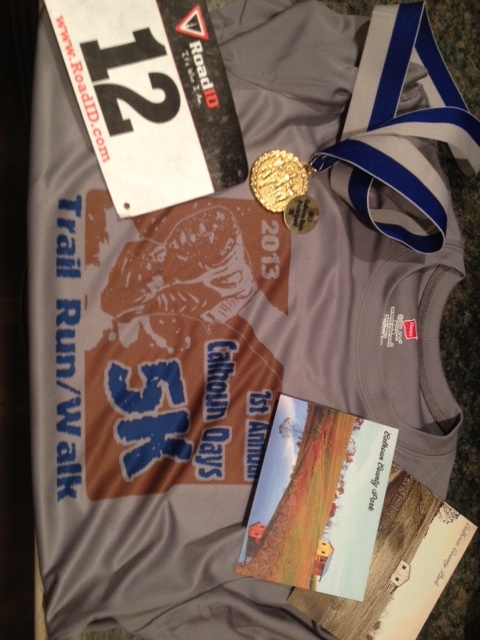 The race T-shirt, souvenir chit, metal, bib and some post cards of the beautiful park. A couple of weeks ago (August 24, 2013) I hit a milestone in my life…I completed my very first half marathon. That’s right… 13.1 miles. My time was horrible and I didn’t do a very good job, but I finished. Actually, around mile six I came to the realization that I had bitten off more than I could chew. Tears started to well up in my eyes as I admitted to myself this race was too hard for a beginner runner. However, I got a grip and decided that, even if I had to walk some I would finish this race. I didn’t walk some… I walked A LOT!! It took me 02:49:08 to complete the 13.1 miles, but I made it across the finished line. I accomplished the main goal… finishing the race. I didn’t hit my second goal of a sub-02:30:00 finish, but I did learn some valuable lessons along the way, So many so that I will save that for another post. Today, I just want to share my thoughts and experience during this amazing race. The half marathon was held at ACE Adventure Resort in Minden, West Virginia. Before I tell you about the race, I’ll share a little insight on the location. ACE Resort is only about 90 minutes from where I live, but I had never stayed in that part of West Virginia before. They’re located on/near the New River and Gauley River. According to the Friends of the New River, it is the oldest river in the USA and the second-oldest in the world. ACE has capitalized on Mother Nature to provide their customers one of the most beautiful and exciting experiences in the state. They offer a variety of activities such as swimming, fishing, white water rafting and kayaking, zip lining, horseback riding, rock climbing and rappelling, mountain biking, paintball and more. They offer several options for overnight lodging from primitive camp sites to luxurious log-style cabins with hot tubs. We chose to pull our camper and hook it up at one of their few RV spots. ACE also provides some excellent food at their pub and restaurant. The resort is a little pricey, but there’s no lack of things to do if you go there for a long weekend or even a week. You’ll stay busy and have a blast the whole time. Well… now about the race, specifically. This race is held by ACE annually with this being their 12th anniversary. They offered a half marathon, a 7.8-mile run and a 5-mile walk. The course was a trail with over 12 miles of the HM in the woods. Three separate times during the HM we ran on gravel roads, but those times were short and sweet. The path through the woods offered participants a definite challenge and absolute beautiful scenery. The challenging part was much more than I anticipated. I knew a trail run would be difficult, but I honestly underestimated the race. Not only was this my first half, but it was also my first trail race, too. I know… I’m a glutton for punishment, or maybe a little bit crazy. There were a lot of hills… some extremely steep. This is a no-brainer since it’s in WV. We ran over and through several stream beds, over fallen logs and even squeezed through saplings to stay on course. At times, the course was too small for runners to pass, but eventually it would widen out enough. It had rained during the days and night preceding the race, so there were a lot of mud holes to get around. I finally gave up and just ran through them. It was fun!! Sometimes the path would be very slippery due to the wet grass and/or leaves on the ground. Runners had to be carefully to keep their feet under them. 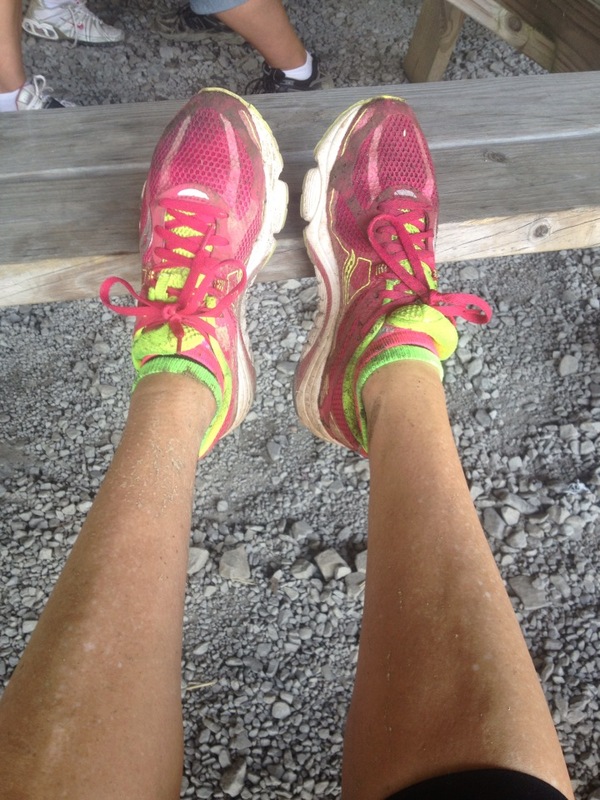 It may be a little hard to tell in the picture, but my shoes were proof that I had just run a trail run. For the advanced, experienced trail runner, I’m sure this course would be an enjoyable run, and it would still offer a challenge. Not as much as it did for me, but it’s not a course sneeze at. I questioned why the race started so late (10:30am), but realized during the run that had it start at the typical 7:30-8:00am race time, you wouldn’t be able to see the trail due to fog making for a more dangerous course. Fortunately the trees kept it cool. We came very close to the New River, but due to the heavy foliage, I could see it… only hear it. At one point I did run close to a beautiful water fall. This was the only time I paused to take a picture… if you look hard you’ll see the falls through the trees. It was breathtaking! It was somewhere around mile 10 or 11, so by this point I would have loved to just go down the hill and stand in the falls to cool off. I did have a couple of complaints, albeit trivial really. The price for the race was only $30, which I’m finding is fairly cheap for a HM, even here in WV. But we didn’t get the traditional T-shirt or finishers medal. That was kind of a let down for me since it was my first HM, otherwise I really wouldn’t have cared. I would have loved to hang that finishers medal with the other race bling I’ve earned this year. And their logo was so beautiful, it would have looked awesome on a T-shirt and metal. Those who did place overall received cash awards, which is always nice, but the ones who finished in their age groups received what looked like a cheap dog tag-style medal. The runners did receive this commemorative mug and free camping on a primitive spot. 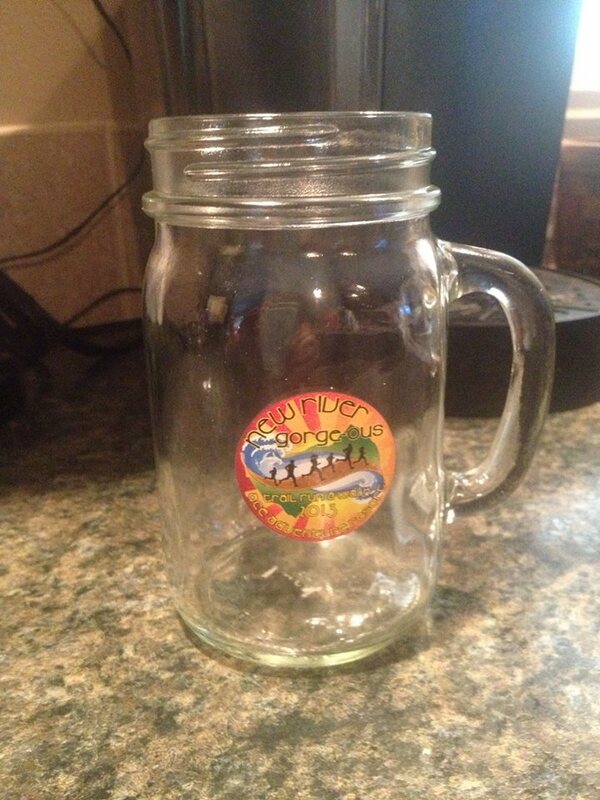 In the mug was some food goodies and three coupons for the lake, zip lining and white water rafting. If you run in races JUST for the bling and T-shirt, you definitely would have been disappointed. But if you were out to get a good workout and experience on an awesome trail run, you would walk away very pleased. The only other complaint is their lack of aid stations. There were only three places to get water during the HM, and only two for those who ran in the 7.8 mile race. Fortunately, I had my fuelbelt to keep my hydrated. I’ve seen HM where they offer up to seven water stations, and 10k’s with up to three opportunities to get a drink. Considering the time of day and the possibility of high temperatures and humidity, more water stations would have been nice. This evening I finished off a nice little 4.5-mile interval training run. That’s typically a short run for me, but I’m taking it fairly easy this week … not laying-on-the-couch easy, but I’m not running the miles as I’m in taper mode. My first half marathon is in just five days, so I don’t want to spend all of my energy before the big race. I started tapering last week when I ran a total of 25 miles, which I’ve been running a little over 30 each week. I’ve read that two weeks out from a HM or a full marathon, you should run around 75%, and cutting back to 50% the week prior. To start this week out, I took Monday as a rest day to recoup from Sunday’s long run. Today was the 4.5 mile interval run, and tomorrow I plan on putting in another 6-7 mile easy run. On Thursday, we’re leaving as soon as we get home from work. We’re pulling the camper to the resort where the HM is being held. I’m hoping we can get there and set up early enough so that I can get in one last short 2-3 mile easy run. I should finish up with a maximum of 14-15 miles for the week which puts me right at the 50% goal. On Friday, I hope to walk on some of the course to get an idea of what I’ll be running on Saturday morning. I know it’s hilly, just not sure how hilly. I’m guessing it’s going to be very challenging. The only thing the description really says about the course is that it includes rolling hills and a 500-foot decline into the gorge. So I’m thinking to myself … if there’s a 500-foot decline, there’s gotta be a 500-foot incline!! I have to say, I’m a bit nervous about this HM. It’s a trail race in a very hilly part of West Virginia … along the New River Gorge in Fayette County, West Virginia. It is small in number of participants, and that is why I decided to make this my first half. There is typically less than 100 runners. The fact that the race doesn’t start until 10:30am is a little unnerving, too. It’s getting into the warmest part of the day that late into the morning. Fortunately, the forecast is calling for high-70’s to low-80’s with nearly no humidity due to a cold front moving in. Guess we’ll have to wait and see. We’ve found us a nice spot at the Riffle Run Campground, one of two campgrounds at Burnsville Lake and set up camp. We like to camp during the week even though we have to go to work and our son, Little Tony is still in school. So yesterday, when I arrived at the campsite after work, the guys were taking an afternoon nap. My training schedule called for a no-run day, on which I usually do some cross training. But since we are camping, I decided to forgo my usual weightlifting or resistance training, and go for a hike. Riffle Run has a couple of trails that go into the woods, and I had been wanting to scout them out as possible trail runs anyway. 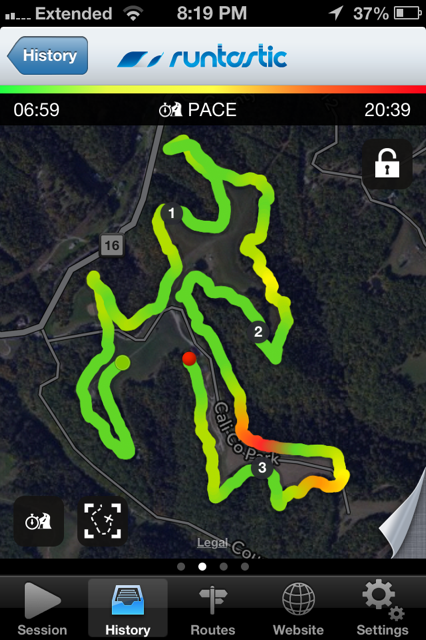 So I laced up my running shoes and grabbed my iPhone so I could map out and measure the trail for future use. The trails begin at the end of the campground just after the last of the sites. Both of them are easily identifiable with the typical brown state park signs. The first trail was called ?? Trail, and headed off into a very short opening in the trees. Shortly after, it became a 4-wheeler trail running along a creek. It was absolutely beautiful with birds singing everywhere. The only critters I saw were a couple of chipmunks and one box turtle. Most of the trail was shaded by trees as it ran up into the woods. The path itself was mostly dirt, but I did walk on some grassy spots at times too. For the most part, the trail was fairly flat, but after about 1/4 mile, and incline started to become visible. Before I knew it, I was walking up the hillside at a fairly steep incline. This continued for nearly another 1/4 mile until I finally gave up and turned back. It was getting late and I still had another trail to scout out. Here is a picture of the hill where I stopped . . .
After I made my way out of that trail, I started down the Riffle Run Trail. This one ran quite a distance across an open field going into the mouth of a hollar. The very beginning of the entire field is kept mowed by the volunteer staff at that maintain the campground. Then the trail is a mowed path winding through the field. The grass on the path cushioned my feet and felt good on my ankles and knees. The grass of the field was almost waste-high, and I could imagine this being the perfect spot for a fawn to bed down in the sunshine undetected by any predator. As a matter of fact, on my way out I did come across a couple of wild turkey who hustled across the trail and then up the hillside through the woods. 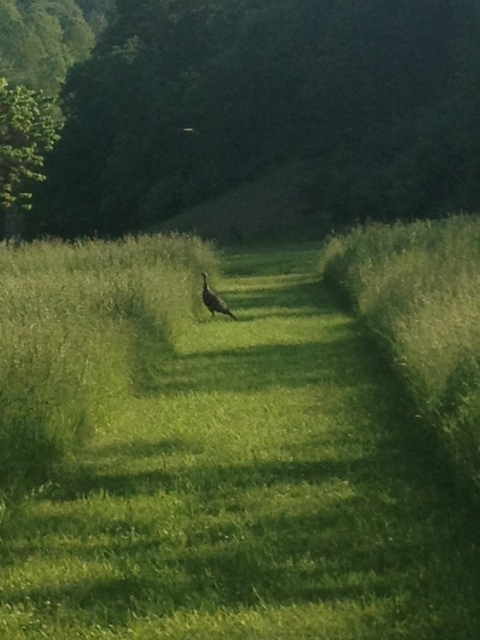 Here’s a pic of one of the turkey near the opening of the trail . 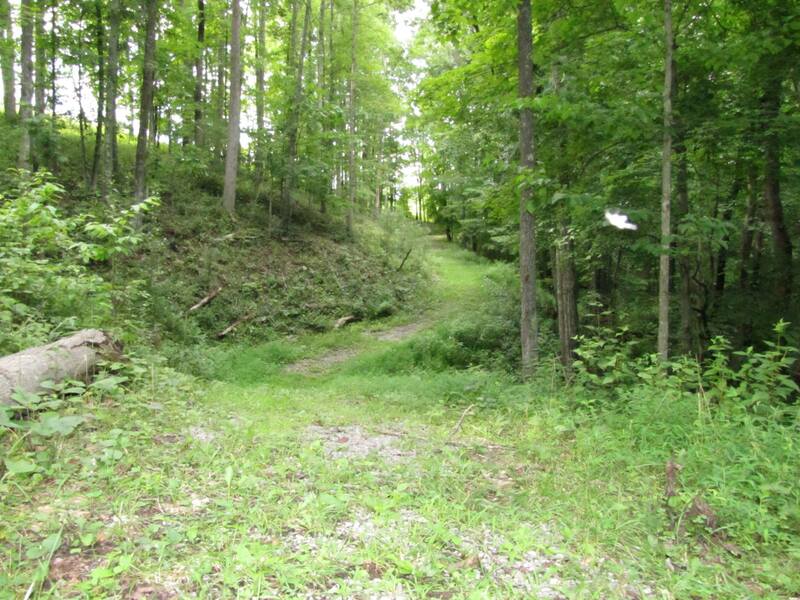 . .
Just after the meadow, the trail crossed a creek then started into some wooded terrain. From this point, the trail hadn’t been mowed, so the grass was very high. There was also thick clover, so it made walking a little difficult. I could imagine easily tripping while running. But the scenery was absolutely gorgeous, the scent of honeysuckle filled the air, and the sound of the water running over the rocks in the creek and critters scurrying away was far better than any music on my iPhone. However, the trail ended after about 1/4 mile as even the deer path through the high grass was getting difficult to see. So I turned around and headed back to the campsite. All in all, from our campsite at the front of the campground, up two separate trails and back to the campsite, I walked 2.5 miles. It was 6:00pm and a warm, sunny evening, so it made for a decent workout. As for running, I will probably give it a try very soon, but unfortunately these trails aren’t really long enough to make an extensive run, although it would be filled with natural beauty and very peaceful. The first trail will make for an excellent hill workout, so I will be more likely to use it over the second trail. There’s possibly more trails at this campground that I haven’t found yet, and need to contact the main office or a park ranger for a map. It will be interesting to see if there is more trails available for possible trail runs, and I look forward to scouting them out as well.